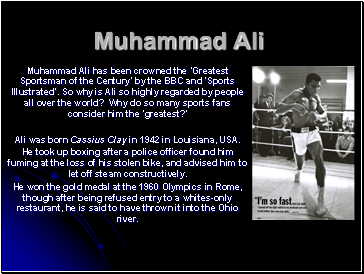 Ali was born Cassius Clay in 1942 in Louisiana, USA. He took up boxing after a police officer found him fuming at the loss of his stolen bike, and advised him to let off steam constructively. He won the gold medal at the 1960 Olympics in Rome, though after being refused entry to a whites-only restaurant, he is said to have thrown it into the Ohio river. ‘What’s my name, fool? 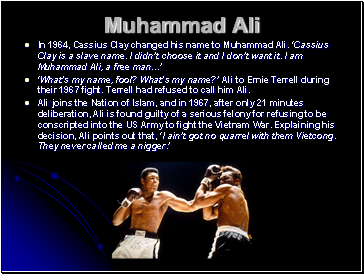 What’s my name?’ Ali to Ernie Terrell during their 1967 fight. 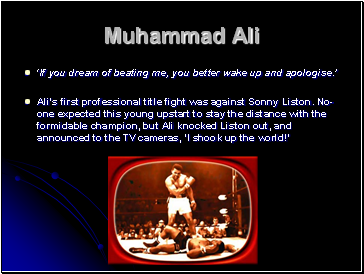 Terrell had refused to call him Ali. 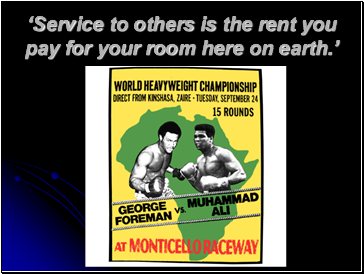 Ali’s most famous bout was however, the ‘Rumble in the Jungle’ against the mighty George Foreman. 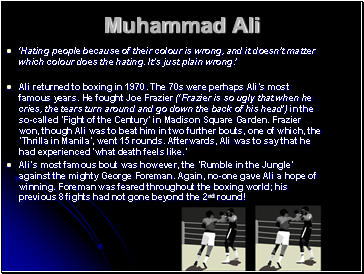 Again, no-one gave Ali a hope of winning. Foreman was feared throughout the boxing world; his previous 8 fights had not gone beyond the 2nd round!